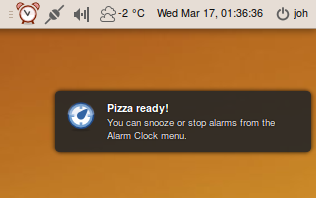 Alarm Clock is a fully-featured alarm clock for your GNOME panel or equivalent. It's easy to use yet powerful with support for multiple repeatable alarms, as well as snoozing and a flexible notification system. 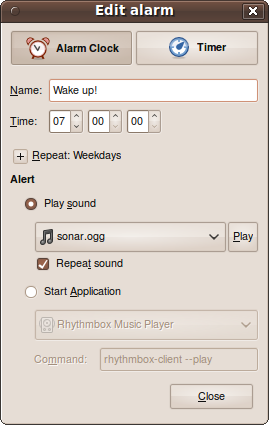 Alarm Clock 0.3.4 "Hipp, hipp" released! Alarm Clock 0.3.3 "Squish" released! Alarm Clock featured on Linux Insider! Alarm Clock 0.3.2 "Indicate this" released! Alarm Clock 0.3.1 "It's gettin' pretty" released! Alarm Clock 0.3.0 "Less snooze" released! This release includes some improvements in the autoconf files which will make it easier to include in debian. See the ChangeLog for details. Some important bugfixes. Please see ChangeLog for details. Fixes bug #261877: All instances of the applet now share the same set of alarms. This release includes some bugfixes. Debs will be up shortly. I've just added Alarm Clock to my PPA! The package name is 'alarm-clock-applet'. Add the hardy repository found at https://launchpad.net/~joh/+archive to you sources and install! This release includes an important bug fix which caused compilation to fail on Gutsy. - Set notification bubble to never expire. - Automatically stop alarm sound notification after 20 minutes. Highlights for this release include: Multiple alarms, different alarm types, repeated alarms and snooze support! The 0.2 release of marks an important milestone of the Alarm Clock development. Alarm Clock now supports multiple alarms running simultaneously. Alarm Clock now distinguishes between two types of alarms: Clocks and Timers. The default type, Clock, will trigger at a specific time of day. The Timer will trigger after a specified amount of hours, minutes and seconds. Alarm Clock will now allow you to specify at what days an alarm (of type clock) should trigger. No need to activate the alarm before you go to sleep any more! An alarm or timer can now be snoozed for a specified number of minutes. This only applies for alarms which uses sound notification. Clicking the applet will snooze all running alarms. To clear all alarms, right click the applet and choose "Clear alarms". 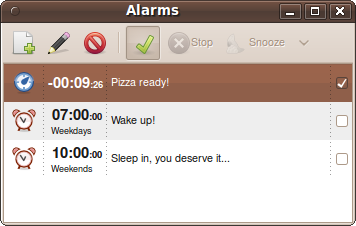 Alarm Clock is easy to use - clicking the panel icon will bring up a list of alarms. From there you can add, edit and delete alarms as well as start, stop and snooze them. Alarm Clock supports two types of alarms: Clocks and Timers. The Clock will go off at a specific time of day while the Timer will ring after the specified amount of time. Alarm Clock will notify you of an alarm by either playing a sound or starting your favorite music player! You can of course specify which sound you would like to use and whether it should be repeated or not. It’s also possible to specify a custom command to run instead of the pre-defined media players. A notification bubble will appear when an alarm goes off, just in case you missed the sound. Both alarms and timers can be snoozed - it's as easy as selecting the alarm and clicking "Snooze". For convenience, the right-click menu of the panel icon provides quick access to snoozing and stopping any beeping alarms. Alarm Clock is powerful and supports multiple alarms as well as auto-repeatable alarms. The latest stable release is Alarm Clock 0.3.4. 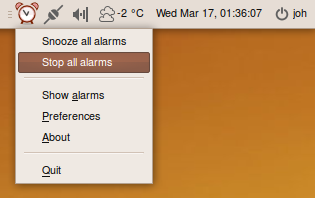 If you're on Ubuntu 9.10 "Karmic Coala" or later, you can install Alarm Clock by clicking this big green button: Yes, I want it! This will install the alarm-clock-applet package. For the latest version with the greatest features, there is a PPA available. To add it, follow the instructions on the PPA page. When you're finished you can click the big button above to install! Refer to the download section above for information on how to obtain and install Alarm Clock on Ubuntu. This section describes the process of installing Alarm Clock from source. Alarm Clock can be built with application indicator support. Support is detected automatically by configure and can be controlled with the --enable-appindicator flag. Please post any bugs and suggestions to the Launchpad project page! Feedback on the various blueprints is also greatly appreciated. If you'd like to see Alarm Clock speak your native tongue, consider helping out with the translations! Last updated: Sun May 17 21:39:49 2015 CEST.